The Spurstow family tree, which was handed down in our family and written up most likely by Francis Spurstow Miller, d.1954, in 1936. The family is traced back to a William Spurstow, sheriff of Cheshire back around 1200-1300. Information on the Spurstow family and a family tree going back to the time of Edward III is in The History of the County Palatine and City of Chester, by George Ormerod, vol. II, published in 1819. Much of the information on the Spurstow family has come from this volume. Going down to more modern times a Richard Spurstow, buried at Bunbury in 1571, had a son and heir, George Spurstow, who was married to Alice Norbury. They both died in 1603 and were buried in Bunbury. George had a son, George, who was married to Elizabeth Anne, widow of Thomas Brooke. He died in 1665 and Elizabeth Anne died in 1661. They had six sons and four daughters. The oldest son was George. This George Spurstow, listed as George Spurstow Jun. of Spurstow, Esquire in the baptisms of most of his children, was born in 1605. This is where problems arise in the tree. He was, according to the tree, married to Susanna Corbet, daughter of Sir John Corbet of Adderley, Shropshire. He supposedly died in 1669 and was buried in Bunbury. "Heere lyeth ye body of George Spurstow of Spurstow in ye County of Cheshire Esqr: who married Susanna daughter of Sr: John Corbett of Adderley in ye County of Salopp Baronet, he dyed 20th of July 1669"
In The Monuments at Bunbury Church, Cheshire, by J. Paul Rylands and F.C. Beazley, Edinburgh, R.& R. Clark, 1918, p.141, there is more information about the George who is buried here, including part of his will in which he names his children living in 1651 when he made his will. He is said to be the grandfather of Charles Spurstow, the last male representative, who died young, and who, or whose sisters, sold the estate to Sir John Crewe of Utkinton. Charles was not the last Spurstow, however, just the last one to live on the family estate. His son, John, died in Manchester and other descendants lived in nearby Chester. 1. The first discrepancy occurs in the page above where George Spurstow, the supposed to have married Susanna Corbet, who supposedly died in 1669, had his will proved in 1665. This obviously raises red flags. How could his will have been proved in 1665 if he died in 1669? There were several George Spurstows – four in a row. In looking at parish burial records, it is easy to confuse one with another. 2. The George Spurstow who was born in 1605 had a last child, Charles, born in 1649. "Chatherine daughter of Susanah Spurstow, relict of Geo Sp. Esq." Source: Parish registers: Bunbury, Cheshire, England, 1559-1953, St. Boniface Church, FHL MF 2093576, Copy of combined early registers, 1602-1681. Burial 27 Nov 1669, Chatherine daughter of Susanah Spurstow, relict of Geo Sp. Esq. Catherine’s baptismal entry on 1 April 1669 lists her as Catherine, dau of George Spurstow. This means that he was alive for her birth but died before her death – most likely in July 1669 – and when Catherine died in November 1669, his wife Susanna was a widow. 4. Susanna Corbet was born in Adderley, Shropshire, to Sir John Corbet and his wife Anne, daughter of Sir George Mainwaring. According to a family tree of the Corbet family, Sir John and Lady Anne were married in 1618 and had twenty children. Their first child was born in 1620 and Susanna was the seventeenth child. George Spurstow, born in 1605, had his first child in 1629 – way too early for Susanna Corbet to have been the mother. This alone rules out Susanna marrying the George who was born in 1605. 5. The George whose will was written 28 December 1651 and proved in 1665 had daughters Penelope, Mary, Anne and Elizabeth (this was the 3d Elizabeth as the two born earlier both died) – named in the will in order by birth. He mentions his 2d son John and sons Peter and Charles. He does not mention his wife. All of his children were born earlier than Susanna Corbet could have given birth. 6. George Spurstow, born 1634, was usually referred to as George Spurstow, of Spurstow, Esquire. George Spurstow, born 1605, was usually referred to as George Spurstow, Jun., of Spurstow. 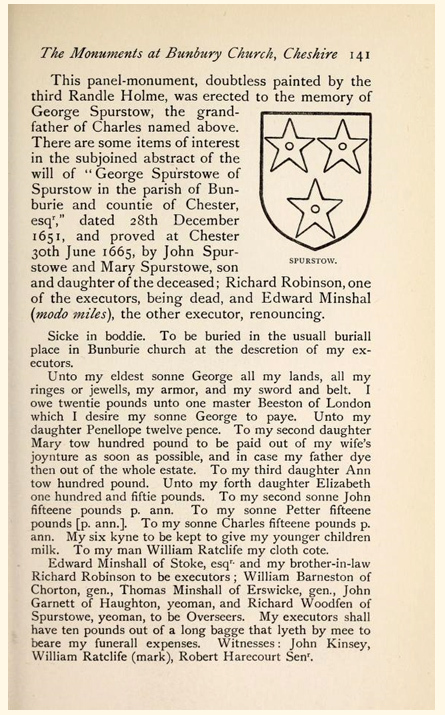 The George Spurstow who died in 1669 was listed in the burial entry as George Spurstow of Spurstow, Esquire. This is a minor point, but does help support my theory. 7.Susanna Corbet had a younger sister Magdalen, christened in 1630, and another younger sister, Grace, christened in 1638. Her older brother John was married to a woman named Lettice. Three of Susanna’s daughters were given these names: Grace, christened in 1656, Magdalen, christened in 1657 and Lettice, christened in 1666. Susanna, christened in 1663, was named after her mother. That Susanna would be the mother of these children makes much more sense. For the above reasons, I feel that the George Spurstow born in 1605 was the father of George Spurstow who married Susanna Corbett. There are more problems with the Spurstow family line which have not yet been untangled. There was a marriage in 1748 between a George Spurstow and an Ann Grace, both of Chester. I am not sure who these two are. George Spurstow, born in 1717, would be the only George of the right age – unless there were George Spurstows who descended from other Spurstow siblings. George Spurstow, born 1717, was married twice, the first time probably about 1749, to a woman named Elizabeth. This Elizabeth died in 1753. Her burial entry notes that she was the wife of George Spurstow, Apothecary. George then married Elizabeth Hayes in 1754. I had thought that his first wife might be Ann Grace, but it seems pretty clear that his first wife was named Elizabeth. The second problem has to do with a legal case. In vol. 3, part 3, p.1728-29, of The Calendar of the Proceedings of the Committee for Compounding.—Cases, published by the British PRO. This case, in April 1647, considers Claimants on the Estate of the late George Spurstow, Spurstow, Co. of Chester. There was a petition that was missing of Anne Spurstow, widow of George Spurstow. On 15 May 1655, “George Spurstow, his son, an infant (does this mean below the age of 18?) begs discharge of the land belonging to his late father. His father and mother died many years since, leaving 9 small children, and their estates much engaged for debt, and his grandmother, who was then living, enjoyed most of the estate.” The case continues for several more lines but no more identifying information is given. I am not sure which George it was who died, nor who the son or the mother might be. There were other Spurstows in Cheshire and perhaps these Spurstows above are related to our family line. More digging might be in order. Spurstow descent report showing twelve generations from George Spurstow, Esq., and Alice Norbury who both died in 1603. 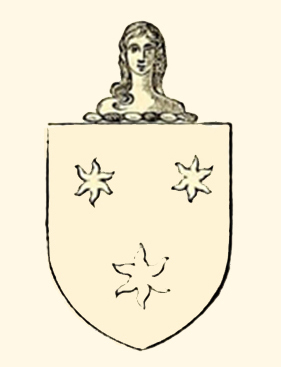 The Spurstow crest comes from the book The History of the County Palatine and City of Chester, Vol. II, by George Ormerod, London, Lackington, Hughes, Harding, Mavor, and Jones, 1819, which can be found online.